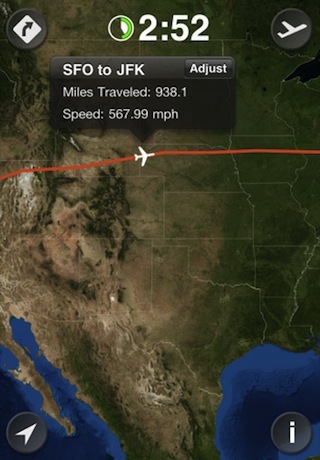 WindowSeat is an app created for frequent flyers who appreciate knowing exactly where they are on a flight. The app was released by AppOven LLC about two weeks ago and is compatible with an iPhone, iPod Touch, and iPad with iOS 4.1 or later. The app costs $6.99 and is the perfect companion for a long and dull flight. WindowSeat’s capabilities are limited by impressive. It costs money to use the airline’s Wi-Fi network so the creators of WindowSeat developed the app so that it functions without the use of GPS. There are numerous travel routes between any two given locations in the continental U.S. due to weather patterns and timing and the app has most of them saved into it. The way WindowSeat works is when you initially get to your seat and have a few minutes to use your electronics before the boarding door shuts you can program in your departure and destination cities and the map will be plotted out. Then put everything away and brace yourself for the terrifying experience of the first 15-30 minutes of your plane ride. Once you can take out your phone, iPod, or iPad again, open WindowSeat back up and it should have a countdown waiting for you indicating how much longer before you have safety landed. The image provided is a map that you can zoom in and out of and an airplane flying over it as a marker of where you currently are on the map. If the route is different, then you can hit the arrow icon and choose one of 5 most traveled routes for that particular flight. Under the countdown clock in the middle of the screen are miles travelled and speed. Along the way there are red dots located all around airplane’s path, which indicate cities, mountains, lakes and reservoirs, national landmarks, and craters. If you tap on a dot a summary pops up of what it is with some background information. WindowSeat is truly awesome. The app is a little pricey so I only recommend it for people who travel regularly so that they can get full use out of it. Even though on a lot of planes the information offered in WindowSeat is provided on a monitor, chances are that the screen will be at least 7 rows ahead of you and probably about 8 by 8 inches and therefore barely legible. Instead of craning your neck and struggling to read the miniature TV screen, you can simply look down and open up WindowSeat. 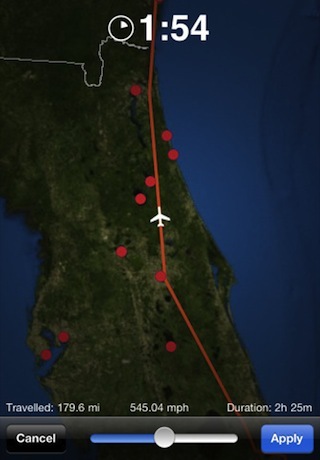 AppSafari review of WindowSeat was written by Vanessa Paszterko on January 18th, 2011 and categorized under App Store, Maps, Travel, Utilities. Page viewed 5619 times, 1 so far today. Need help on using these apps? Please read the Help Page. Did you mean to say that without a WiFi connection it can use GPS alone? Otherwise, I’m not quite sure what, “It costs money to use the airline’s Wi-Fi network so the creators of WindowSeat developed the app so that it functions without the use of GPS,” really means.